Last year I collected together some paintings of cinemas from various artists (see here), and it’s high time we had another little round up of what can be found on the internet. First, the Newham Story website features two paintings by Eric Dawson of cinemas in this borough of London showing the magnificent interior of the Broadway cinema, Stratford, and the Carlton Cinema. You can find information about the history of cinemas in Newham here. Eric Dawson: The intermission. The Broadway Cinema, Stratford. Next, another painting by William E. Rochfort from the Surrey Artists website that seems to be very much in keeping with the nostalgic affection artists have for the cinema. No-one paints multiplexes, and there is often an innocence to the way in which cinema-going is depicted. James Guentner’s depiction of the Art Cinema in Pittsburgh shows a very different side to American film theatres that punctures the naive image above. You can out more about the artist here. Paul Titterton is a member of the Bolton Art Circle and his painting of The Lido cinema is every bit as evocative of a certain era of cinema-going as the other works here. Cinemas are a popular topic for paintings and they are also a popular place to exhibit artworks; but while books of photographs of old cinemas are popular I cannot recall seeing anything specifically devoted to paintings. This is a shame because it is clear from the examples here and in the earlier post that artists draw on historical references and cultural memory to present an image of cinema-going that is very much at odds with the modern experience. They can tell us a great deal about how we relate to these places, and as many of the artists tend to be local to the areas they paint there is a certain ‘folk culture’ element that I find interesting. I’m sure someone must have done a study on this subject but I haven’t been able to find anything specific. Paintings of cinemas are also about recording what is now lost. 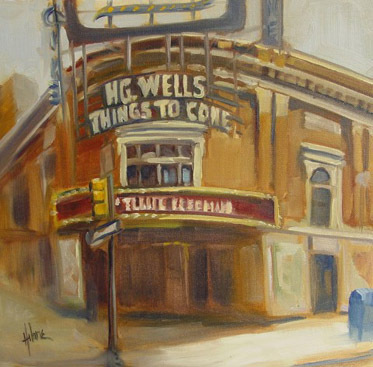 John A O’Neill’s painting of the Lyric Theatre was completed just a few weeks before The Lyric burnt down in 1995, and you can find an image of it ablaze here along with a history of the cinema. 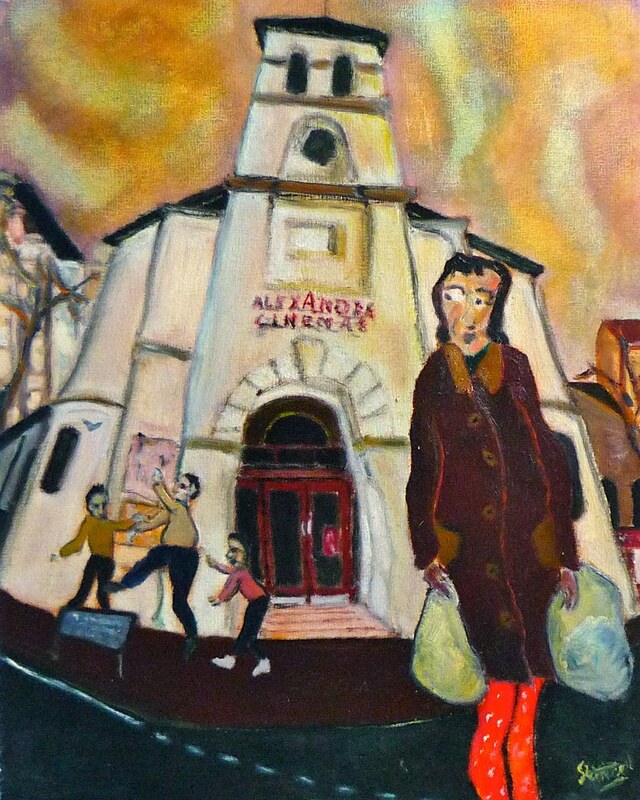 This week we have a mini art exhibition of paintings of cinemas. This post contains only a small selection of paintings by a handful of artists, and it is easy to find many more examples using Google’s image search. This first work is by Anna King, and is of the now disused Odeon cinema in Bradford (just down the road from the National Media Museum). Anna’s website can be found here, and you can learn about the history of Bradford’s cinemas here. This next painting is by William E. Rochfort. Many of his paintings are inspired by cinema and you can find out about his work from the Surrey Artists website here. Next is David Stuttard, and you can find The World of David Stuttard website here. You can also find out more about Lambert’s work at her blog here, including some more recent paintings of theatres. This piece is by Peter Hobden, and you can find this and his other paintings of cinemas at his blog here. This is the Osio Cinema, Monterey, by Karen Mazzarella. What is interesting to note is that these artists have chosen to paint small cinemas rather than multiplexes. The exception is Anna King’s painting of the former Bradford Odeon, which she included in a series of works about wastelands and disused buildings. 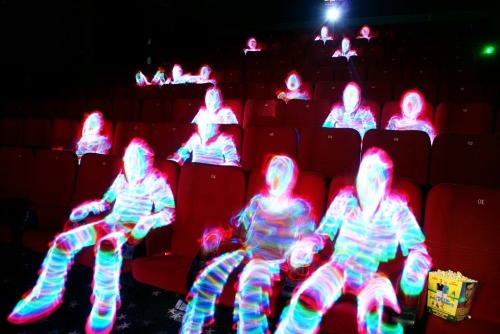 Finally, this is one of Finnish artists Janne Parviainen’s light paintings, and presents a very different perspective to William Rochfort’s painting of cinemagoing. You can find his website here and his flickr page is here.